Our latest endeavour with Rugby Canada was the development of a complete training series for their Rookie Rugby program - aimed at helping kids and coaches fine tune their skills on the pitch! In all the project called for 25 individual videos, showcasing different aspects of the game and skill techniques to go with them. With the invaluable help of the Rugby Canada and USA Rugby staff, we built out complete scripts along with a shoot plan to keep everyone organized. And like clockwork, our team worked with the kids and coaches to complete the drills one-by-one, ensuring we had all of the angles covered by placing one camera on a boom for a bird's eye view! Using the slo-motion capabilities of our gear, we were able to record every frame of the play to give us flexibility in post-production. Once in editing, we carefully followed the script to highlight the key facets of each drill, and used some custom-designed graphics to call out the important learning points throughout. While it makes for a slow and meticulous process to ensure every video is a perfect portrait of proper technique, we're always happy to take the time to do the job right. You can take a look at more videos in the series over on the Rookie Rugby website! It’s no secret that rugby is one of the toughest games on the planet, demanding the best of its athletes both physically and mentally. But with concussions very much in the spotlight, and player welfare always at the top of mind for coaches and officials, Rugby Canada has revamped their PlaySmart program – and asked us to create a video that introduces the program to an online audience. Once we developed the script in collaboration with Rugby Canada staff, our team attended a number of community games, training sessions and international events (including the Canada Sevens World Series stop in Vancouver) to capture all of the people who hold a stake in player safety – from players young and old to fans and referees. That meant maintaining a consistent look and feel across a number of different venues, while also helping our interviewees understand the context of their lines to help the final product flow. In editing, we ensured the pace was quick and lively while also delivering a message that is paramount to all involved in the sport. This piece points users to a website that offers training tips, injury prevention and concussion awareness information that will help Canadian players (and those abroad, as well) to play safe and PlaySmart. With the HSBC Women's Rugby Sevens in full swing at Westhills Stadium in Langford, the team at Rugby Canada invited us to capture the action during the intermissions, where kids from across the capital region were showing off a new youth program - Rookie Rugby. It wasn't difficult to build off of the energy in the park, and that made for the perfect environment for this promo shoot. We really wanted to convey the fun the kids were having during the game, and knew that the best way was to hop right into the middle of the action! While most of our shoots require a bit of a workout, chasing the kids around the pitch at WestHills Stadium with our AllSteady Pro gimbal was cardio training to the max. Kids also present a whole new set of challenges when it comes to interviews, but we chatted with a half dozen of the players as soon as they got off the field, and their reviews of Rookie Rugby were glowing. It's a great chance to learn the basics, grow their skill sets and make some friends. The national team athletes spoke just as highly about the flag football program, and it's clear that the next generation of rugby players in this country will be on the right track with Rookie Rugby. We teamed up with the national rugby program to help raise funds for their plan to construct a training facility adjacent to the Rugby Canada office in Langford. The goal was to outline the growth of the program over the past five years, and how such a building would propel the organization on to even greater stages in the years ahead. In a brief window between matches and training, we borrowed the services of Harry Jones, Justin Douglas, Brittany Benn & Bianca Farella to show us what it's like to be in the middle of the action. 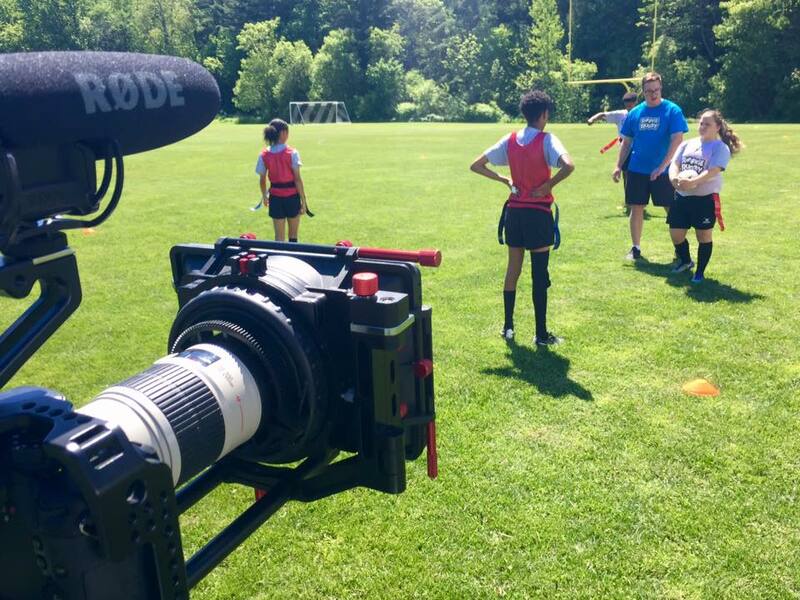 We spend a hot summer after running around the pitch at Westhills Stadium, capturing various training routines with the help of our AllSteady Pro 6 gimbal. We also attended a couple of on-field and off-field training sessions with the entire team to add a little extra energy to the clip. Then we captured aerial images of the facility site with our DJI Inspire 1 drone, and used Google SketchUp and After Effects to overlay the planned mockup from de Hoog & Kierulf. With a few game highlights to add one final blast of energy, we polished off this piece that will be leveraged at pitches and presentations across the country on the road to construction!